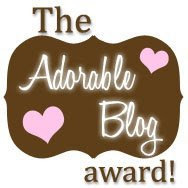 I've been tagged by Lynn for the "Adorable Blog" award! awesome, I am so adorable anyway right? (can hear someone cursing). Thanks Lynn for awarding me this cute award! So it seems I can nominate as many people as I like, but just to keep it short n sweet, I'll pick 10 coz later I am sure there will be many other awards to nominate! i felt like winning the oscar pulak, hehhehe =P love ya miu2!!! te quiero mucho mi amiga!! !